Hugh Segal is the fifth Master of Massey College at the University of Toronto. 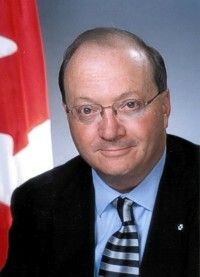 While in the Senate of Canada (Conservative, Ontario) he Chaired both the committees on Foreign Affairs and Anti-Terrorism. A graduate ‎in history from the University of Ottawa, he is a former President of the Institute for Research on Public Policy in Montreal and Senior Fellow at both the Queen's School of Policy Studies and School of Business. He is the Honourary Chair of the Navy League of Canada and a Senior Fellow of the Canadian Defence and Foreign Affairs Institute in Calgary. An honorary Captain in the Royal Canadian Navy, Hugh holds honorary doctorates from the Royal Military College and his Alma Mater. He was made a member of the Order of Canada in 2003.